Speaking of Camp Butner (NC)… the 2009 F-Class National Championships commence today, Sept. 30th, at that range. America’s top F-Class shooters, and many competitors from overseas, will compete for honors in the nation’s fastest-growing long-range discipline. Competitors will be divided in two classes: Open and F-TR. Open Class allows any chambering under .40 caliber with a total weight of about 22 pounds, and a front pedestal rest may be used. F-TR class is limited to .223 Rem or .308 Winchester chamberings, with a max weight of 18.15 pounds. In most F-Class matches, F-TR shooters are limited to bipods — no pedestal front rests allowed. Hosted by the North State Shooting Club, the Nationals kick off today (Sept. 30th) with open and team practice sessions. Thursday (Oct. 1) is the 600-yard phase of the event, followed by 1000-yard phases on both Friday and Saturday. Sunday is reserved as a make-up day in case of rain. On both Thursday and Friday, a 4-person team match follows the individual events. Barring rain delays, the National Champion will be crowned on Saturday after three final individual 1000-yard matches. 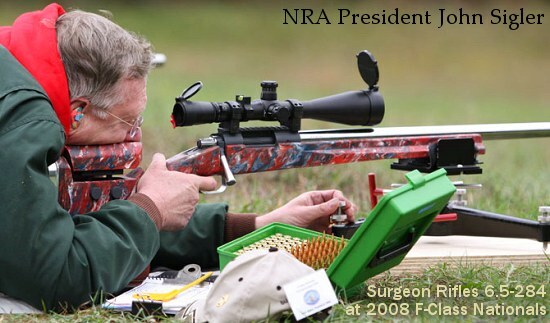 For more information, visit the North State Shooting Club website, or CLICK HERE to download the complete 2009 F-Class Nationals Program. Share the post "F-Class Nationals at Camp Butner Commence"
Can’t seem to find any results posted anywhere, yet. Ideas?